Absorb the music found in these five psychotic and violent tracks that perfectly exemplify the evolutionary path within the Black Metal field of this distinguished Italian act. Listening to the distinct Atmospheric Black Metal engendered by Italian act Lorn feels like contemplating a work-of-art by an unusual modern artist, changing its shape and form and bringing forward new elements every single time you stare at it. Since its inception in 1999, this alluring band from Bolzano, a city in the South Tyrol province of north Italy, has been delivering fresh extreme music through each of their releases, never sounding repetitive or outdated, with their full-length albums Towards the Abyss of Disease (2006) and Subconscious Metamorphosis (2013) being their most remarkable works to date. Now in 2017 Lorn are back with Arrayed Claws, featuring five psychotic and violent tracks that perfectly exemplify their evolutionary path within the Black Metal field. If Subconscious Metamorhposis was a transcendental mental journey towards a superior illumination, Lorn’s new album looks more like a physical and desperate odyssey through the regions of Death. 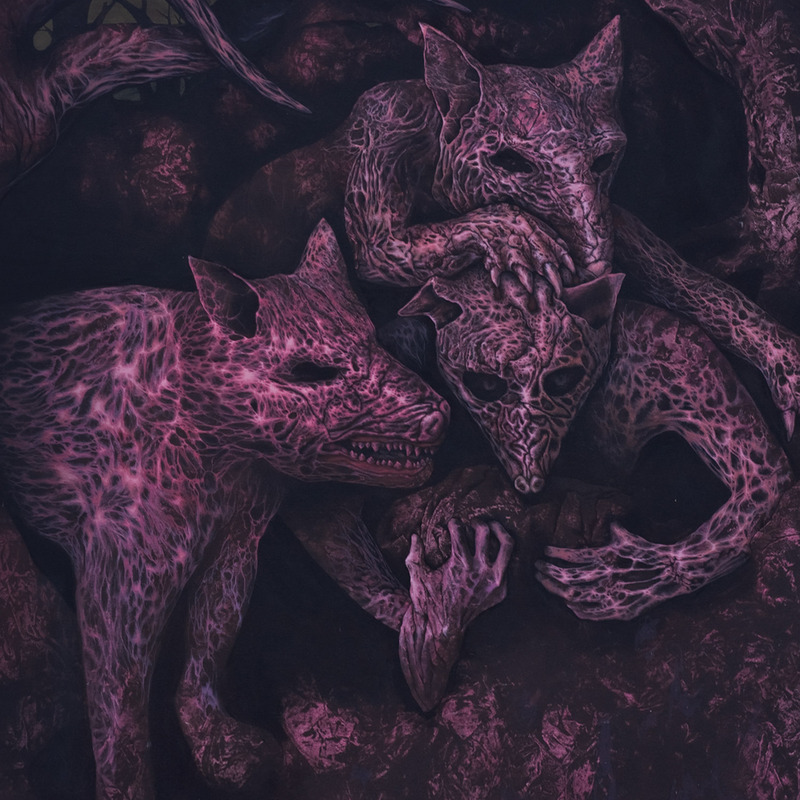 Featuring a classy artwork by Joel Angelini, with layout by Francesco Gemelli, Arrayed Claws will disturb your peace of mind and take you to the obscure realms of Black Metal crafted by the band’s mastermind and multi-instrumentalist Radok. Hence, as aforementioned, every instance you take a listen at such eccentric album you’ll experience different thoughts and feelings, expanding your comprehension of what atmospheric and experimental Extreme Metal truly means and, therefore, enhancing your personal connection with the music by Lorn. In the opening track, titled Disharmonic Feticism, a darkened squall of brutal, extreme music hits the listener without clemency, with drummer Chimsicrin discharging furious old school Black Metal beats while Radok showcases all his skills through his demonic gnarls and violent riffs, not to mention its beautifully deranged lyrics (“Intentness / So that nothing correspond / Intolerance to the familiar / Orgasmic grate”). After seven minutes of violence and chaos, we face four minutes of a calm atmospheric passage to help soothe our souls, proving how broad extreme music can be when played by the right musicians (especially if they come from Italy, a never-ending source of high-end Black Metal). Their sonic demolition comes back in full force in Abstract Trap, a solid display of vicious Black Metal with Death and Thrash Metal elements to make it more aggressive, with the beastly Chimsicrin being unstoppable behind his drums. Moreover, this is another long, complex composition where again after around four minutes the band transitions their demonic music to an eerie atmospheric aura, with the difference that this time their havoc returns after a short while, with its ending feeling phantasmagorical and menacing. The second half of the album offers the listener two songs inspired by the Altaian mythology, two stages of a purification path. Toybodim, a fast-paced high-end Extreme Metal tune showcasing possessed vocals and lancinating guitars, takes its name from a black lake where the souls of the dead fall and become larvae, which can be seen in its lyrics (“Miserable parasite / The cowardice inebriates your void / Hidden haughtiness / Allegiance frighten your rotten self”); whereas the multilayered instrumental tune Sut-aq-Kol is a lake of milk where the spirits get purified, a placenta for the newborns. Musically speaking, this second song continues with Lorn’s banquet of extreme music, once again displaying boisterous drums and infernal riffs. The transition between these two tracks to the atmospheric Aus Nebel Turm aims at leaving the listener beaten and dismayed, with the painful awareness of being only a grain of nothing, lost in mysterious fogs of existence. After an ominous beginning, the music flows into pure Atmospheric and Experimental Black Metal, concluding the transcendental journey proposed by Lorn. As mentioned in the beginning of this review, every single time you take a listen at the music by Lorn you’ll feel different, and if you’re ready to experience and absorb all the fury and complexity found in the five tracks of Arrayed Claws, simply go to the I, Voidhanger Records’ BandCamp or webstore to purchase this unconventional and extremely well-crafted album. Also, in order to keep track of such distinguished act, go visit Lorn’s Facebook page to know more about their music, future releases and other details, as a project like this that can unite harmony and disharmony in such enthralling way definitely deserves our sincere support. Best moments of the album: Disharmonic Feticism and Toybodim. This entry was posted in 2017 New Releases and tagged abstract trap, arrayed claws ep, atmospheric black metal, aus nebel turm, black metal, bolzano, chimsicrin, disharmonic feticism, experimental black metal, exteme metal, francesco gemelli, i voidhanger records, italy, joel angelini, lorn, radok, sut-aq-kol, toybodim by Gustavo Scuderi. Bookmark the permalink.